Goodbye Gina Linetti: Chelsea Peretti leaving Brooklyn Nine-Nine Cast • Tips, Trends & News in 60 Seconds or Less! On January 31st, Brooklyn Nine-Nine character Gina Linetti said goodbye to her family, the 99th precinct, in actor Chelsea Peretti’s final episode of the show. The popular cop sitcom featured its last episode with one of the main cast members last month, after recently being renewed by NBC for a sixth season. While Peretti’s character was an office aid and not a cop, she was definitely the most glamorous of the bunch and fan favorite. 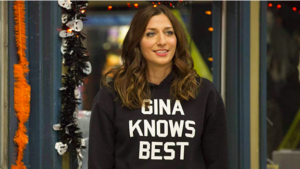 The episode in question let Peretti go in the most “Gina” of ways: each character was given a scene with Gina, and in the end, she left them with some words of wisdom which she described as a parting gift. Chelsea Peretti was one of the three women in the main ensemble, as well as main actor Andy Samberg’s childhood friend (which mirrored their on-screen characters’ relationship). The farewell was bittersweet as the episode description includes Gina “leaving the family,” but her team is excited to see what the future has in store for her. One upside to the parting is that now Dirk Blocker and Joel McKinnon (Hitchcock and Scully, respectively) are now featured in the opening sequence credits, taking Peretti’s penultimate place. ← Baby, It’s Cold Outside: Let’s Have Game Night!